Super Hero Boy: What you talking about, Germs? What you talking about, Germs? You know I'm the farthest thing from a germafob. With my first born though we really did attempt to make an honest effort as far as making sure his pacifiers were always spotless and his bottles disinfected between each use. Now I find myself going from the five second rule on things hitting the floor to the 30 seconds to "um.. it looks clean". Actually I belive to an extent that over shielding your children from regular old germs actually hurts them over helps them. With all that said I do obviously disinfect all of our eating surfaces and bathroom. There is a huge difference between some dust bunnies on the floor and not properly cleaning up after cooking. Though my biggest gripe about the whole cleaning situation is most disinfectant products are way too harsh. I really hate to use them around my newborn and seeing as he is always fussy its rare that I get to put him down. So not only am I pressed for time but the products I use have to be baby safe. 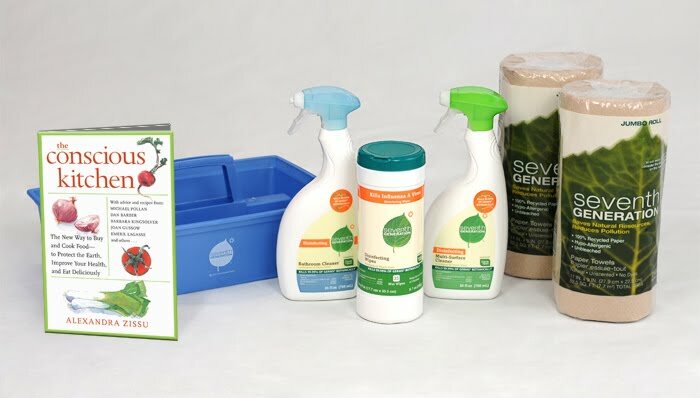 Seventh Generation has been one of our favorite sources for cleaning products for some time now due to the fact that they do not use harsh chemicals and still do the job as well as the ones that do! Seventh Generation has a brand new line of disenfectant products including a disenfectant wipes, which by the way even my mom got excited about. The new disenfecant line includes an ingredient made from Thyme called thymol which kills 99% of germs and is safe to use on even children's toys and high chairs. Now that really is something to get excited about. My mom is a paper towel junkie to the point that we actually argue about how she is killing way too many trees. Seventh Generation also has a line of recycled paper towels which may not still be an excuse for my mom to go crazy but at least I feel a little better about her "paper towel habit". 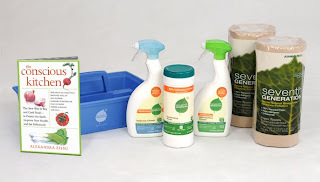 Seventh Generation and My Blog Spark sent us a great package that included some of the new Seventh Generation disinfectant cleaners, recycled paper towels, and a book called the The Conscious Kitchen which has great tips on how to effectively go green in your kitchen. I know it's sometimes really challenging knowing even where to start but we just started by switching our every day all purpose cleaner to a more eco friendly version and slowly have moved up from there one product and one step at a time. Now I'd say about 80% of the products we use in our home are ecofriendly. The biggest and hardest step for us was going from using paper towels to using washable rags. I only keep paper towels on hand now for covering food in the microwave and quick emergency cleanups. We even attempt to use fabric napkins now instead of paper ones when possible. 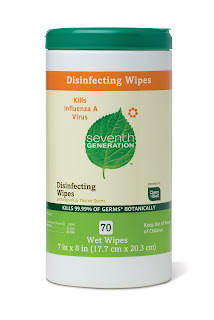 We absolutely adore Seventh Generation products and especially love the Disinfectant Multipurpose cleaner. One thing I really love about Seventh Generation products is how they seem to continue to keep things smelling great well after I've finished cleaning without leaving a chemical smell. I use the disinfectant cleaners in my diaper bins and they really seem to cut the odor left inside the trash cans really well. Seventh Generation and My Blog Spark has given us a second gift set of products to give away to our readers! It includes a great selection of Seventh Generation products including the new disinfectant wipes, all purpose cleaner, a carrying tote and a copy of the book The Conscious Kitchen ! Leave a comment on this post. Just check out the Seventh Generation and tell us which product is your favorite or which one you'd most like to try! This contest will end April 30th at midnight! Disclosure: We received our Seventh Generation gift pack and giveaway free of charge from Seventh Generation and My Blog Spark to do this review. My opinions and comments on items we review are always my own and are never influenced by sponsors. I want to try their diapers the most - for my kiddo! I would like t try their diapers. I want to try the Chlorine Free Maxipads. I have used the paper towels and the baby wipes and love them. I would love to try the diapers. I'd like to try their trash bags. I would like to try the multi surface cleaner, because that is what I use most in my home. I would love to try the Delicate Care Laundry Detergent. I would like to try Seventh Generation's Natural All Purpose Cleaner. I'd like to try their liquid laundry soap. Would love to try their chlorine-free diapers. I would like to try the automatic diswasher packs. I would like to try the Natural Fabric Softener Sheets. I'd like to try the Free & Clear Automatic Dishwasher Powder! I would love to try the disinfecting wipes. I like the multi surface cleaner because I have many different surfaces in the house that need cleaning. I'd really like to try their Emerald Cypress & Fir Tub & Tile Cleaner. I would love to have some of the Multi Purpose Cleaner. I really like their disinfecting wipes. Thanks! I am a subscrber by email. I want to try the disinfecting bathroom cleaner. I haven't tried them yet, but I'd love to try their 100% recycled paper towels. Then maybe I wouldn't feel guilty about using paper towels! Would like to try the lavendar Natural Fabric Softener sheets. I'd like to try the Emerald Cypress & Fir Toilet Bowl Cleaner. I want to try the shower cleaner - green mandarin and leaf. I would most like to try the White Flower & Bergamot Citrus Natural 2X Concentrated Laundry Liquid! I am now subscribing to your mailing list. I would love to try the Botanical Disinfectants. I would love to try the Green Mandarin and Leaf Shower Cleaner. I love their free and clear dish detergent. I would love to try their diapers. I would love to try the baby wipes, thanks! I would love to try the 2X Concentrated Baby Laundry Liquid. I'd love to try their dishwasher detergent. there all purpose wipes,I have tried them&love them! My favorites are the Laundry Liquid and Fabric Softener. Thanks. I would like to try the disinfecting wipes for my kitchen counters. I would love to try their disinfecting wipes!